On Saturday's Early Show fill-in co-host Russ Mitchell saw passage of the tax deal as a possible "turning point for Mr. Obama's presidency" and speculated that it was "perhaps setting the stage for another victory as the Senate takes up the repeal of the 'Don't Ask, Don't Tell' law." In the report that followed, correspondent Whit Johnson declared that with the deal "President Obama could finally declare victory." The headline on screen read: "The President's Big Win; More Success Before The Holiday Break?" Johnson explained "that after months of debate, they [Democrats] finally have the votes to repeal 'Don't Ask, Don't Tell.'" In a report on Sunday Morning, Johnson touted the eventual repeal of the policy on Saturday as a "major victory" for Democrats. At the top of a report on CBS's Sunday Morning, correspondent Whit Johnson proclaimed: "In San Francisco yesterday, they celebrated the end of an era. After nearly two decades, the policy of 'Don't Ask, Don't Tell,' which bans gays and lesbians from serving openly in the military, is all but history." The one-sided segment focused almost exclusively on supporters of repeal. Of the ten sound bites featured throughout the story, only one, that of Arizona Republican Senator John McCain, was critical of the policy being overturned. Johnson described how "Opponents of repeal...pleaded that such a dramatic change during a time of two wars would put troops in harm's way." However, after the clip of McCain was played, Johnson dismissed critics of repeal: "Democrats got a boost from a recent Pentagon study in which two-thirds of U.S. troops said changing the controversial law would have little impact, a feeling shared by most of America." As all the broadcast network evening newscasts on Saturday used words like "historic" and "landmark" to describe the Senate vote in favor of repealing the Don’t Ask, Don’t Tell policy on homosexuals serving in the military, the networks also provided substantially more soundbites to supporters of the measure than to those who opposed changing the policy. "A stain on our nation has been lifted," is how one civil rights leader put it tonight, and President Obama says, quote, "No longer will our nation be denied the service of thousands of patriotic Americans just because they are gay." This Senate vote was very personal for thousands of service members. Major Mike Almy served in Iraq but was discharged when the Air Force learned he was gay. He's been battling Don't Ask, Don't Tell ever since. CBS’s John Dickerson also brought up civil rights as he called the vote a "civil rights victory for the President," although he also uniquely used the term "liberals" to refer to some of the President’s supporters who advocated the policy change. Dickerson: " Well, it's definitely a civil rights win for him, and it’s a win politically with liberals in his party, and they’ve been angry with him. They were angry with him on this issue in particular because they felt like he wasn’t pushing hard enough. 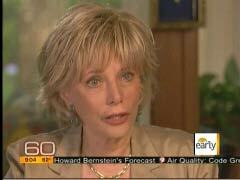 CBS’s Stahl to Jimmy Carter: ‘You Blame Teddy’ for Killing Universal Health Care? Saturday’s The Early Show on CBS showed a preview clip of correspondent Lesley Stahl interviewing former President Jimmy Carter for 60 Minutes in which Carter blamed former Senator Ted Kennedy for derailing his universal health care plan in the 1970s. Stahl referred to former Senator Kennedy as "Teddy" as she asked Carter if he held Kennedy responsible. Stahl: "And you blame Teddy for the failure?" A clip of the interview can be found on the CBS News Web site. 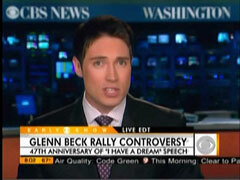 Just like NBC and ABC this morning, CBS’s The Early Show had a hostile take on Glenn Beck’s “Restoring Honor” rally scheduled for Saturday on the Mall in Washington, D.C. Correspondent Whit Johnson labeled Beck a “controversial conservative,” event speaker Alveda King (a niece of Martin Luther King, Jr.) a “longtime advocate for conservative causes,” and suggested that the fact that some attendees “will get there on Tea Party-sponsored buses” contradicted the idea that this would be a non-political event. Yet talking about liberal rabble rouser and onetime Democratic presidential candidate Al Sharpton, Johnson offered no ideological labels or even a tag that Sharpton might be “controversial.” Instead, Sharpton’s event was described as a rally “hosted by civil rights leaders,” and showcased his slam: “The things that Beck stands for are antithetical to the civil rights movement." 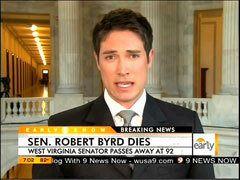 On Monday's CBS Early Show, correspondent Whit Johnson reported breaking news of the death of West Virginia Senator Robert Byrd and proclaimed: "By all accounts, he was one of the hardest working senators in modern history." Johnson touted Byrd's "four volume history of the Senate" and described him as the "unequaled master of the Senate rules." Part of the "hard work" Johnson cited was the massive number of pork barrel projects Byrd secured funding for over his long career: "Byrd said he owed his success to the long suffering people of West Virginia and he returned the favor by steering billions of dollars in federal government projects to the state, dozens of them, named for him." Johnson noted how "Byrd reveled in his success at bringing home the bacon....His critics called him the king of pork. He called that hog wash."
Another aspect of Byrd's career that Johnson highlighted was the West Virginia Democrat's opposition to the Iraq war: "A harsh critic of the war in Iraq, Byrd said opposing the war in 2003 was his most important vote ever."